It's sort of appropriate that this weekend marks the biggest shopping event of the year in the US, because this post — which just happened to be scheduled for this week — relates to shopping. Unlike the numerous kinds of shopping available to most of us this weekend, I grew up in a couple of very small remote communities with extremely limited shopping options. Both places had a "Bay" (i.e., The Bay, AKA The Hudson's Bay Company) and fortunately enough, they were very much representative of traditional department stores of that era, selling groceries, clothing, hardware and furniture. And yes, they had a fabric and pattern department that very much sustained my mother's — and later my — sewing efforts. Therefore, the short story is that all of us were able to clothe and feed our families and generally maintain a household even without thirty — or even three — different retail options. Supplementing that lack of choice, however, were a couple of retailing giants who each spun off at least three catalogs a year for our home shopping pleasure. We knew them as Eaton's and Simpsons Sears (later, just Sears). Between the two of them, I was always more of a Sears customer. To this day, I don't recall anything that I may have ordered from Eaton's, but can remember everything from toys to my grad dress to my sewing machine that came from Sears. We lost Eaton's in 1999. (Ironically, some of its remnants were picked up by Sears at the time.) A little over a month ago, we officially began the process of losing Sears. And in a very real way, it's been heart-rending. ... and get a free gift with your CYBER MONDAY purchase! On the first day of liquidation sales, I happened to be nearby and decided to go in and check it out. Just from seeing those loud yellow and red signs on the door (that I had last seen on Target Canada doors two and a half years ago), I found myself feeling anxious and oddly emotional. Once inside, it occurred to me that I had never seen the store so full of people... not even at Christmas. A small part of me silently admonished the crowd with the thought that, "if all of you had supported the company over the past decade, it would never have come to this". But that's not fair; the sorry tale of Sears actually features a lot of top level management mistakes that had nothing to do with shoppers. 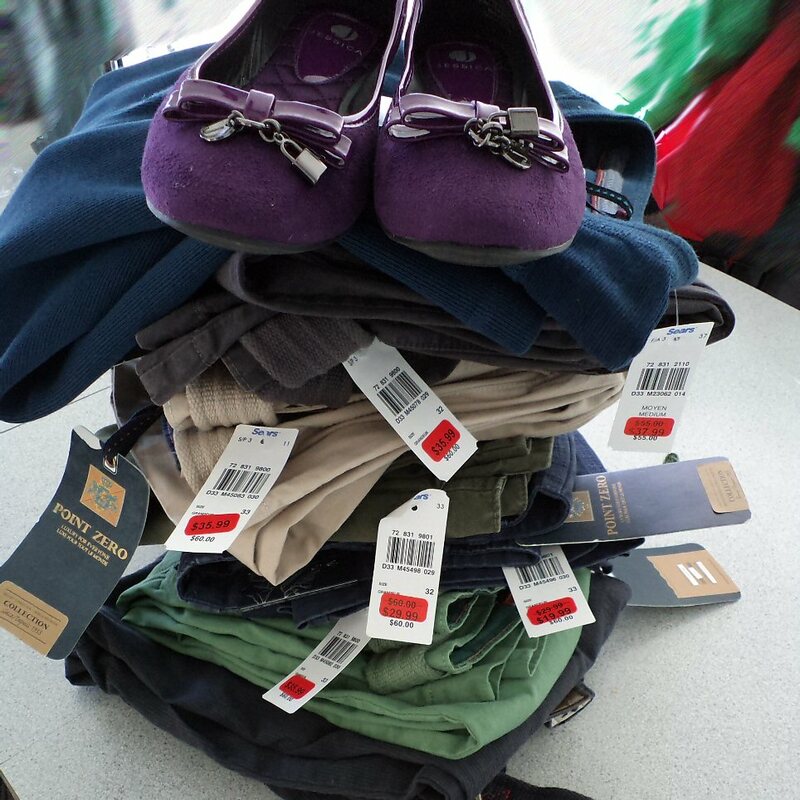 A memorable post holiday haul from Sears in 2014... all this for hubby (shoes were mine) for under $100! The thing is, 21st century retail is an increasingly difficult puzzle to solve. Maybe Sears could have made some adjustments a decade ago that would have changed their fortunes for the better. Or maybe, like everything else on earth, all retail companies have a finite lifespan and there is just no saving them when their time is up. You might wonder why I'm writing a blog post about this. Well, in the past few years, I've noted that Sears continues to carry a range of sewing machine accessories, particularly for their Kenmore brand. I recall telling my mother that if this day comes to pass, I'm going to have to pick up some of those little items. 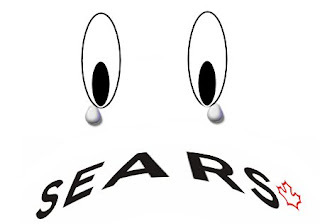 Well, three days into liquidation, I went back to Sears — to pick up an online order. (The timing of the order was extremely fortuitous. It was submitted on the evening of October 9; the news came out on October 10 that they were going out of business. Two days later, their e-commerce site was pulled.) Before I went to the merchandise pick up counter, I scoped out the sewing area. To my utter surprise, it was already picked through. Why was I surprised? Because there was no actual discount marked anywhere. Oh, the big signs all over the place indicated savings between 20% and 50% but there was also the accompanying small print stating "some exceptions apply". Anyway, here is the funny story that I promised in the title of this post. Do you see the prices circled on the items and on the receipt in the above picture? In case they aren't clear, the needles are marked $4.99 on the package but rang through at $5.49. The bobbin thingies are marked $4.49 on the package but came through as $4.79. That's right. I went to a liquidation sale and paid MORE than sticker price. In this case, what was worse was having to deal with a ditzy sales person who initially said that the price difference was because of tax. When I showed her where the amount of tax appeared separately on the receipt, she rescanned the items and told me that those are the prices and that she has no ability to adjust them, due to the liquidation. Not only that — again, because of the "final sale" aspect of the liquidation — she couldn't refund me the items if I didn't want them. I brushed aside a momentary fit of pique to appreciate the total irony and insanity of the situation and headed downstairs to pick up my online order. The last laugh was probably mine. The order I picked up consisted of two pairs of sandals, each marked down from $39.99 to $14.97, a savings of over 62%. In the store, footwear was currently being liquidated at 20% off. Had I been able to find those shoes — and in these types of clearance sales, there is no way of establishing what store has what stock, so good luck with that scenario — they would have been selling for $31.99 a pair... or more. But all things considered, there is no last laugh to be had. It may only be the latest casualty of modern retailing, but I'm going to miss Sears. It feels as though little by little, time is chipping away at significant stuff from my youth. So many big stores have closed in the nearly 20 years I have lived in New Mexico. The Sears outlet store went out of business several months ago. I didn't give that store a chance from the beginning, because it was just wasn't a place people would shop at and never saw any customers there. He Sears in the nearby mall has been teetering for years and I wouldn't be surprised if it closed altogether. They adjusted their store hours years ago to open later than the other stores, like 11:00 or 11:30. It is obvious to me that Sears has been poorly managed for years. My very first sewing machine I bought was from Sears. I think it cost me $100. Their tool department was always a great place for men to shop because of the great quality. Times change. People shop online more now, so a lot of businesses are dying. Even Macy's closed last year in the mall near me, however the other Macy's is still open, but too far to drive to unless I am going in that direction. There have been a lot of other stores that have closed over the years too. As they say history repeats itself, but it appears no one listens, pays attention or even cares. The CBC reported recently that there is going to be an investigation into the Sears liquidators raising prices. Sears denied that the price raising is happening but your experience is just one more piece of solid evidence. Shame on everyone concerned. What I find funny is that when Sears first announced their problems a group of the executives were supposedly interested in buying the co. - the very people who were the cause of its downfall. How funny is that?! Funny or not, I was hoping for that teeny tiny minute possibility that it might come to fruition. But it was not to be. In the first days of the liquidation, I remember reading on CBC about how people thought they were being taken advantage of in terms of discounts being not what they seemed to be; i.e., they were based on MSRP, while "Sears the store" may not ever have sold the original items at MSRP. To me, that's basic buyer beware and the liquidators have the legal right to do that. To purchase something and have it be more than sticker price, however... well, that's something else entirely!